Amsterdam might be known for its many vices, but that’s far from what defines this Dutch city. Visit during the summer, and you’ll witness the city in full bloom, with greenery-lined parks packed with families, floral markets in full swing, and locals sipping coffee alongside the city’s picturesque canals. In the summer, you’ll also have the chance to experience Amsterdam at the height of its long growing season. Cafés, restaurants and markets across the city flaunt crisp vegetables, plump fruits and delicate greens, not to mention plenty of fresh cheeses and just-caught fish. As a gluten-free traveler, I reveled in the city’s celebration of its native products. In Amsterdam, gluten-free fare takes a healthy turn, with local ingredients and fresh, innovative presentations. If you’re a history buff, you’ll want to start your tour of the city right in the heart of the action. Home to Amsterdam’s central railway station, the majestic 13th-century Old Church, the Anne Frank House and the Rembrandt House Museum, the Centrum’s origins date back several centuries. Amsterdam’s city center also is the focal point for its UNESCO-protected canals. Hundreds of years old, Amsterdam’s many canals travel through the city, serving as scenic landmarks among the narrow lanes and historic buildings. The canals also are the setting for the Bloemenmarkt, the only floating flower market in the world. Whether you’re in the market for a bouquet or you’re just window shopping, don’t miss this colorful display in the Centrum. Work up an appetite as you wind your way along the canals and head toward the area known as The Nine Streets. These cobblestone streets tell the stories of several centuries of history, but they’re also lined with some of the city’s most contemporary boutiques and cafés. Pancakes, located in the heart of The Nine Streets, straddles the line between historic and modern-day by serving traditional Dutch pancakes jazzed up with creative toppings. Though not all of the pancakes here are gluten free, the knowledgeable staff can guide you toward the safe options. 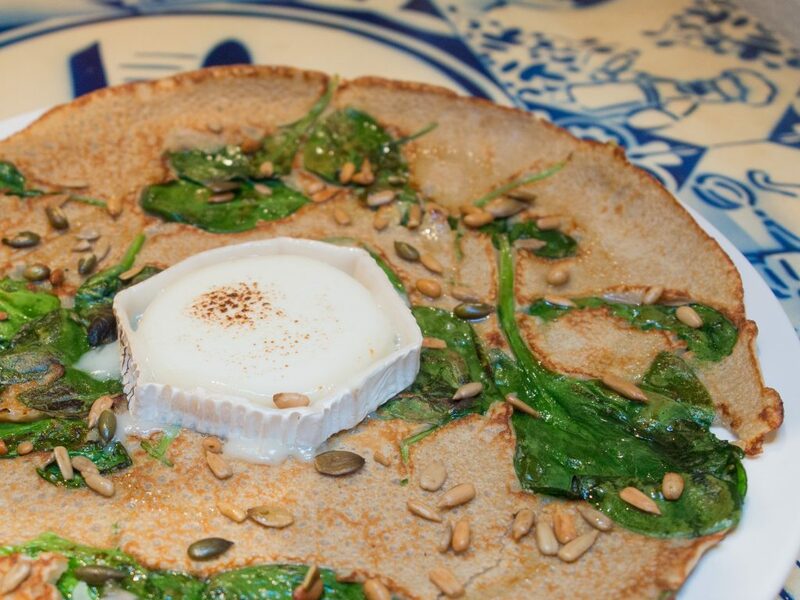 I opted for the gluten-free pancake with goat cheese, spinach, garlic oil and pine nuts—a savory mouthful with plenty of flavor. If you have a sweet tooth, go big with the banana with mixed nuts and chocolate sauce, or stick with the simple lemon and sugar. Perpetually on the forefront of what’s cool in Amsterdam, De Pijp is one of the quirkiest neighborhoods in the city. Get a feel for the area with a stroll through the Albert Cuyp Market, a lively street market that takes over the area six days a week. Here you’ll find everything from local snacks to secondhand clothes to local souvenirs. Located just off of Albert Cuypstraat, Cottoncake captures the feel of De Pijp under a single roof. This stylish shop is both a clothing boutique and café, and it’s a solid pick whether you’re looking for a new outfit or hungry for a bite to eat. After learning she was gluten intolerant, owner Jorinde Westhoff found eating gluten free to be difficult in Amsterdam. She put her newfound gluten-free baking expertise to work, added a hint of her fashion publicist background and opened Cottoncake. A boutique on the first floor, Cottoncake features one of the most fashionable cafés in town in its loft area. The perfect spot to linger with a coffee and a freshly pressed green juice, this café also has an extensive gluten-free and vegetarian menu. 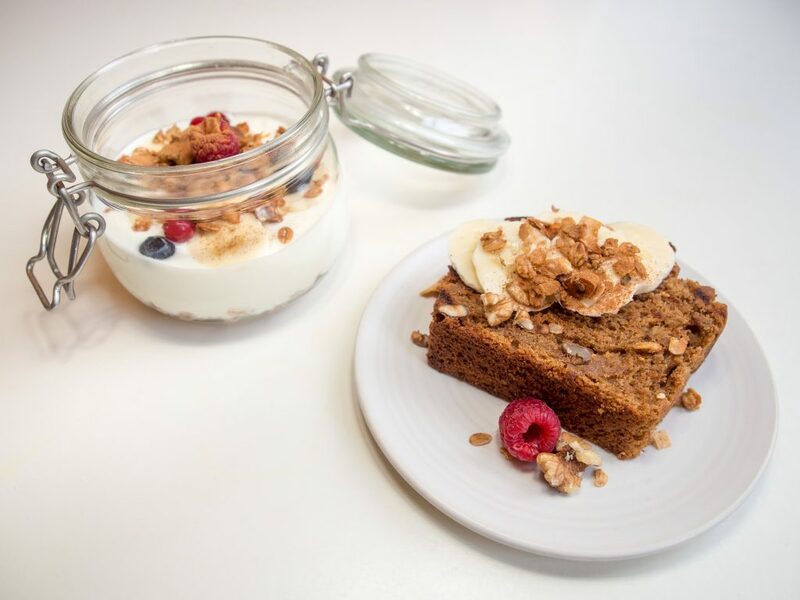 I found the homemade granola with yogurt and freshly-baked banana bread a light and healthy way to start the day. Dive further into De Pijp with a stop at Venkel, just down the road on Albert Cuypstraat. This hip spot highlights fresh produce, displaying leafy greens, ripe fruits and root veggies all over the restaurant. 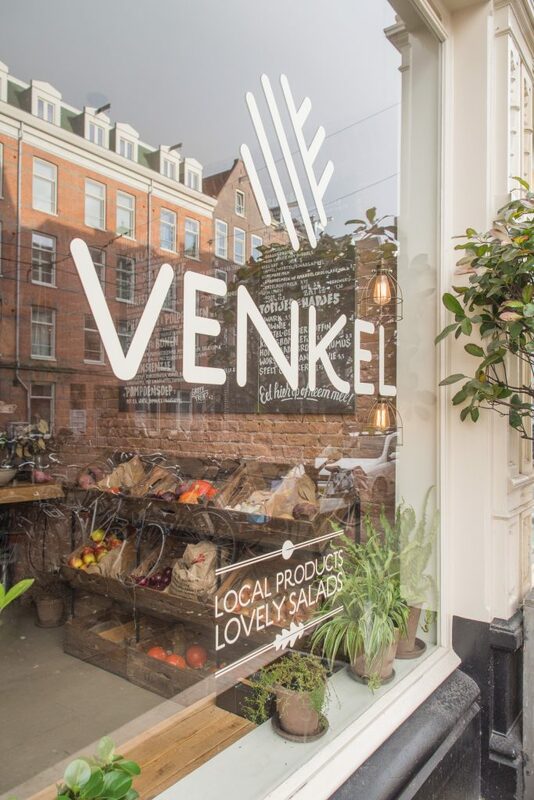 Unlike the sterile salad joints I’m used to in the U.S., Venkel truly gets its customers excited about eating plants and other local products. While salads don’t necessarily fit into traditional Dutch cuisine and fast, casual dining isn’t common in Amsterdam, Venkel owner Elnaz Bahrami is a pioneer of both. Propelled by a personal decision to eliminate wheat from her diet, she developed a wide range of hearty and natural gluten-free recipes. That’s why just about all of the salads at Venkel are naturally gluten free, and every salad is packed with fresh vegetables, meats, grains and nuts. More than just nutritious, the menu at Venkel also highlights some of the best elements of De Pijp. Many of the ingredients here are hyperlocal, including veggies from neighborhood farmers and honey made right in the city. Even the platters at Venkel are made from the wood of Amsterdam trees. Take a stroll through the Jordaan, one of Amsterdam’s most popular neighborhoods, and you might feel as though you’ve stepped back into an earlier version of the city. When it comes to gluten-free fare, however, the Jordaan is far from antiquated. My favorite spot in the neighborhood, Piqniq, focuses on the traditional Dutch midday meal and encourages you to enjoy it al fresco. Like its name suggests, Piqniq is organized picnic-style. 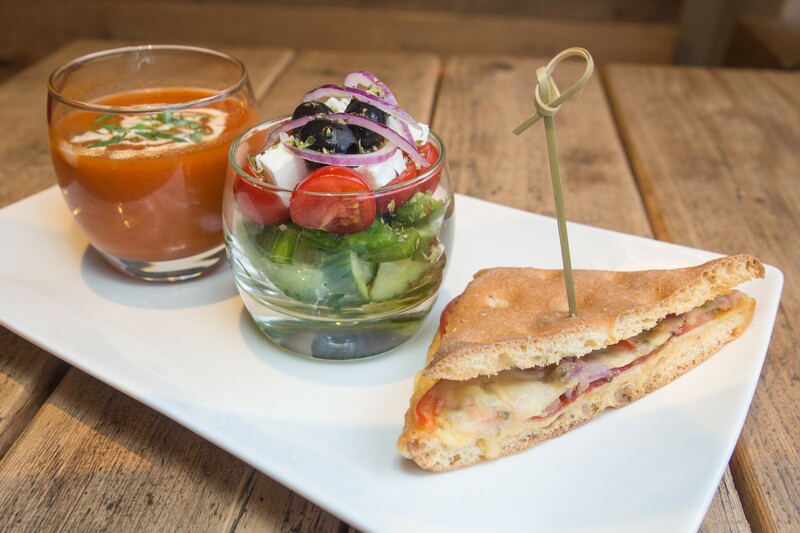 Instead of offering large, heavy meals, this café invites you to create your own meal out of smaller soups, sandwiches and salads. Though only part of Piqniq’s menu is gluten free, owner Paulien Gmelig prepares everything with care. Requests from her gluten-free patrons prompted her to start producing and sourcing gluten-free food, since she wanted everyone to feel welcome at the café. You’ll typically find gluten-free sandwiches and even sweets on the daily menu. While you certainly can dine at this welcoming café, many of Piqniq’s patrons take their meals to go and enjoy them in one of the city’s many parks. For a real Amsterdam experience, call ahead and reserve a basket filled with your choice of gluten-free goodies and have a leisurely picnic at the nearby Westerpark or the popular Vondelpark. On the west side of the city, Oud-West Amsterdam has undergone significant changes in recent years. Long known for the scenic Westerpark and other large green spaces, Oud-West also has become a hotspot for both fine dining and innovative popups. 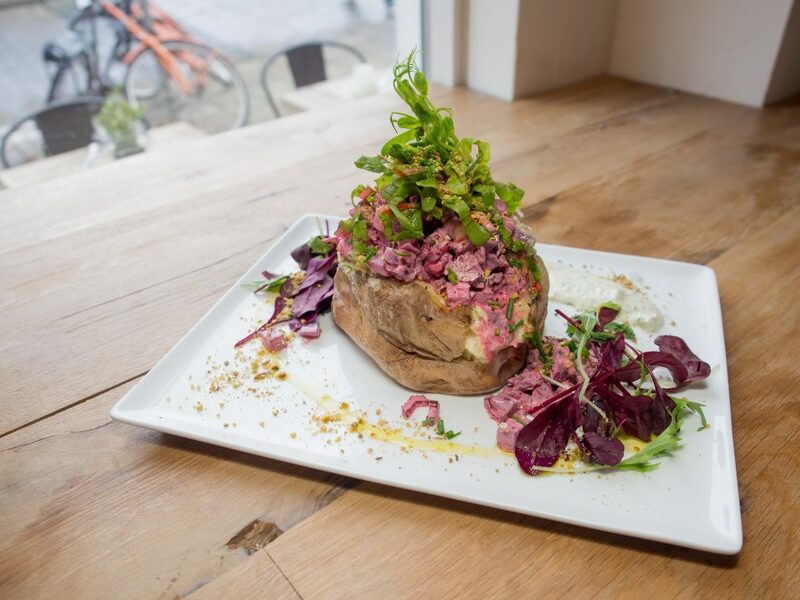 A relative newcomer to the area, Jacketz prides itself on being the first baked potato shop in mainland Europe. If you’ve ever indulged in a stuffed baked potato, you might think you know what you’re getting here. Add a dash of Amsterdam’s healthy, fresh focus and a sprinkling of surprising flavors to the blank canvas of a classic potato, and you have Jacketz. This fast, casual chain takes oversized baked potatoes, mashes the tender insides with plenty of butter and adds toppings of your choice. I couldn’t get enough of the beetroot salad potato, stuffed with creamy and vinegary beets and topped with fresh greens and flavorful dukkah. A few blocks down the street in Oud-West Amsterdam, Spaghetteria is a great pick for a nice sit-down meal in the neighborhood. This contemporary Italian restaurant specializes in homemade pasta, fresh seafood and perfectly paired wine. While you won’t find homemade gluten-free pasta here, Spaghetteria does offer pre-made gluten-free pasta, which the staff takes care to cook and prepare separately. Choose the penne with spicy tomato sauce or the spaghetti with mussels and a garlicky white wine sauce, and you’ll settle right in to this buzzy pasta spot. A must in Oud-West Amsterdam, the Foodhallen is a sort of indoor street food haven. This large warehouse-like space is packed with food vendors who expertly prepare everything from frites to kebabs to fresh gluten-free food. My favorite stop in the Foodhallen, Friska, makes a sushi-wrap hybrid with fresh fish, grains and vegetables. Whether you try the Oh My Goat with quinoa, goat cheese and beets or the Shrimptease with shrimp, avocado and soy chili dipping sauce, you can rest easy that everything here is both fresh and gluten free. No matter if you’re looking for a quick snack while sightseeing or you’re seeking ingredients to prepare a feast in your apartment kitchen, you’ll find a handful of great places to shop for food in Amsterdam. For one of the best selections of gluten-free items I’ve found anywhere, head to De Glutenvrije Winkel. Located on the east side of town, this dedicated gluten-free shop has many of the international brands you already know, along with countless European brands and local products. If you need a gluten-free beer or treat to complete your meal, De Glutenvrije Winkel has you covered. For the city’s best produce and tons of packaged gluten-free treats, head to Marqt, Amsterdam’s answer to Whole Foods. For a great selection of organic foods and certified gluten-free items, make EkoPlaza your destination. For a dedicated store brand on a budget, go to Albert Heijn, which is ubiquitous in the city. 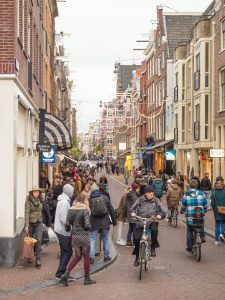 All of these stores have multiple locations and are convenient to several of Amsterdam’s top attractions. Whether you’re a cycling enthusiast or you’d rather explore the city on foot, you’ll find plenty to do, see and taste in Amsterdam. The Dutch capital is a memorable destination year-round, but a summer getaway captures Amsterdam at its freshest.